We have had many requests to produce another calendar. Our first calendar was a huge success that covered December 2012 through February 2014, a 15 month calendar with photos of our Silver Screen Legend outfits one through fifteen. 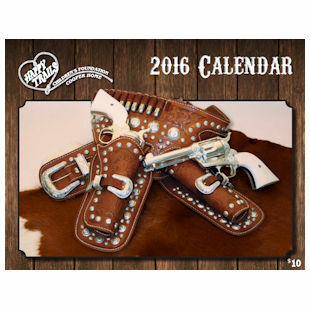 Our new calendar is for the 12 months of 2016 featuring Silver Screen Legend Colt firearms and Hollywood style double holster rigs for number 15 through 18 plus each of the great saddles we have offered through the years, including the current Early JW Saddle that will be given away at our annual FRIENDS OF HAPPY TRAILS BANQUET in May 2016. Hard to believe but we are now well into the 18th year of our partnership with Colt on the Silver Screen Legend project that has raised more than two million dollars to benefit the abused children we serve! This was not an inexpensive calendar to produce so we are selling them for $10 each postpaid or two for $15. Additional copies are $5 each. Quantities are limited so place your order today along with your order for SILVER SCREEN LEGEND XVIII tickets.